To possess genius — to have cultivated your talents to a degree which places you above the level of a prejudiced and half-educated community — to be incorruptible in a corrupt society — to have acquired, in virtue of your office, secrets which make you dreaded by the guilty — these are crimes which society, in a low state of morality, never has forgiven, never will forgive. They are, in fact, crimes which in every age have driven the perpetrator of them to exile, to proscription, and to death! The truth of this statement has been illustrated by many noble examples, but of these there is not one more striking than that of Jacopo Bonfadio. One of the most brilliant writers of the sixteenth century, a philosopher, a poet, and a historian, occupying one of the most important posts in the republic of Genoa, it was the fate of Bonfadio to be sentenced to be burnt alive for an offence which he had not committed, simply because, in his Annals of the Genoese, he had given certain indication of the possession of knowledge, which some influential families considered compromised themselves. Cosl series’ei, cosi fu fatto a punto. Are just the events which occurred. It was because these annals were so true — I may say, so uncompromising in their truth — that they drew upon the author an anger, born of a lax perception of moral duties, which could only be satiated by his death. Written by Bonfadio in Latin, and translated into Italian by Paschetti, in 1586, they constitute to the present day the most valuable history of the events of the administration of the country after the recovery of its liberty by Andrea Doria, including the account of the conspiracy of Gianluigi Fiesco. I will but briefly refer to the other writings of Bonfadio. They may, including those specially mentioned, be comprised under the following headings: I. His ‘Carmina,’ or Latin elegies; II. His rhymes. III. His letters. IV. His translation into Italian of the oration of Cicero in defence of Milo. V. The Annals of Genoa. VI. Poems translated from the Greek. Regarding these I will extract only one criticism, and that will be on his elegies. Of these Antonio Abate Sambuca writes: ‘To all who examine them they appear a chef-d’oeuvre, whether for the perfection and regularity of the language, for the strength and novelty of the sentences, for the expression of the affections and manners, for the nobleness of the figures, for the clearness and sweetness of the style, and for the happiness and vividness of the rhyme.’ Of his poetry I shall give specimens at the end of the story, which I propose now to narrate, of his career. 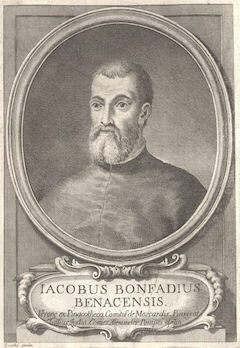 The precise date of the birth of Jacopo Bonfadio has not been traced, but it is certain that he came into the world about the year 1500. He was born in Gazano, a small property in the Riviera di Said, in the province of Brescia. This property was situated between Salo and the river Clisi. He always believed that his family was of German origin, of noble race, and that his ancestors, settling on the banks of the river Clisi, had pursued there the vocation of blacksmiths. Such was the family tradition; but there seems reason to believe that he may have been mistaken, and that his ancestors were mountaineers of Brescia. This, however, is of little consequence. Jacopo early displayed a happy disposition, and his natural genius was fostered by a careful education. At an early age he was sent to Verona and placed under the care of Signor Niccolo Pellegrini. Thence he migrated to Padua, to finish his studies at the university of that famous city. Here he so distinguished himself as to be accounted one of the most promising scholars of the university, from which he in after years received the degree of doctor of law. It was probably a little after this time, when at Venice, on his way to his native place, that Bonfadio incurred the temporary displeasure of two famous men of letters, his friends Paolo Manuzio and the Padre Ottavio Pantagato. It would appear that some four years previously the padre had made certain corrections in translations made by Bonfadio from the orations of Cicero. The translations as originally made Bonfadio had given to Manuzio, but he had refused to send him the emendations. Nevertheless, he did give or sell these to a printer named Giunta. The story is chiefly interesting from the insight afforded into his character by the letters of excuse he wrote on the subject to Manuzio: ‘Tramentino,’ he wrote, ‘gave me your letter. You can conceive how agreeable it was to me, and I thank you from my heart. I shall reply confusedly, for my mind is now agitated by pleasure and displeasure. I shall begin with that which weighs most upon it. ‘It is true that on the departure from Venice of the friend to whom I owed my life, it being necessary for him, in a matter concerning his honour, to go to Rome — he having no money even for his journey I was assailed by him with the most earnest and ardent prayers I ever heard, and, having no other means of succouring him, I did give to Giunta those corrections made four years ago by Padre Ottavio in certain orations of Cicero which you had from me in the Casa Colonna. … And although the cause which induced me to do this was one of humanity and duty, as you see, I am nevertheless liable to be blamed by the other side because I have disobliged you.’ He proceeds then to enter more fully, and with great feeling and eloquence into the case. The letter is a masterpiece of pleading, and of successful pleading, for it removed all anger from the mind of Manuzio. Shortly after this correspondence Bonfadio received an offer to proceed to Spain in the suite of the Signor Guido Bagno, envoy of the Duke of Mantua. He accepted the appointment, in every respect very desirable, but he arrived at Rome to take it up only to find that Guido Bagno had just died. Full of sad thoughts Bonfadio at once quitted Rome for the kingdom of Naples. In this he passed many months travelling. He visited the places most famous for their beauty, their antiquity, and their historical recollections,. reaping much enjoyment, though, he adds very feelingly in a letter, no profit. In fact, his means at this period appear to have been extremely restricted. Having explored Naples, and found it intellectually barren, Bonfadio had resolved to proceed by sea to Venice, thence by land to Padua — the city of his education. But at this juncture he received a letter from his friend Marcantonio Flaminio, strongly urging him to return by way of Rome, as he would find in that city a patron in the person of Cardinal Ridolfo Pio di Carpi. He followed the advice, was well received by the cardinal, and assigned a stipend. Still retaining this he set out for Padua, where he had determined to fix his abode. He proceeded thither by way of Florence and Ferrara, renewing his acquaintance with valued friends at both those places. Arrived at Padua, fortified by his five years’ experience of the shallowness and instability of a courtier’s life, Bonfadio applied himself steadily to the study of the fine arts and of philosophy. He lodged in the house of Cardinal Bembo, who had for him so great an esteem that he appointed him one of the tutors to his son Torquato. He devoted likewise a considerable portion of his time to the education of the youth of the city, earning thereby their gratitude — for his name had become already established. Many thoughts of how to better his position appear to have crossed his mind at this period. At one time he endeavours to obtain the position of tutor in a well-to-do family; at another he strives to establish an academy for instruction in moral philosophy and ethics; at another he asks for an ecclesiastical benefice. But, if all these efforts were unsuccessful, a very long time did not elapse before he reaped the fruit of his studies. Just after he had learned that his application for the benefice was not likely to prove successful, there came to him from Genoa the offer of the Chair of Philosophy in that city. He promptly accepted it, and repaired without delay to his post some time in the year 1545. Bonfadio went to his new labours with a light and cheerful heart. Nothing could have whispered to him that he was about to take up his abode amongst a people by whom his erudition, his honesty, his want of sympathy with every kind of corruption, would be imputed to him as the most heinous of all crimes. There was no cloud on- his brow now. In the other parts of Italy in which he had lived, he had been esteemed, honoured, and loved. The voice of envy and jealousy had never been raised against him. Enjoying at Rome, at Naples, and at Padua, the society of the most cultivated and intellectual men of the day, he might well have hoped to find some members of that class in the city still virtually governed by Andrea Doria. At all events there could be no suspicion in his mind that the very virtues which had caused him to be selected for the post to which he had been called, would prove, in the eyes of an influential portion of the Genoese society, defects so great as to necessitate his death. We find recorded in his own letters his first impression of Genoa and its society. ‘I like Genoa,’ wrote he, after his arrival, to his friend Count Fortunate Martinengo. ‘I like Genoa, both for its position, and for all those peculiarities about it which you have seen. I have some friends, amongst them Messer Azzolino Sauli, a well-educated and refined young man. This winter I read the first of the Politica of Aristotle to an elderly audience, rather merchants than scholars. I am, then, up to a certain point happy, but am not without some annoyances. Towards the end of July I shall come to Brescia on my way to the lake.’ It is clear from this extract that he was little satisfied with the quality of his scholars. The same dissatisfaction may be traced in another of his letters. He writes: ‘The country is beautiful, the air good, the conversation agreeable; and if the intellects here were as fond of letters as they are of traffic in sea matters, I should be still better pleased.’ Still he never hesitated to declare himself quite satisfied with his lot, and ambitious of nothing beyond it. To the duty of reading philosophy there soon became joined another. This was no less than to take up the history of the Republic at the point where it had been left by Uberto Foglietta, and to continue it. Bonfadio willingly applied himself to the task thus thrust upon him by the Republic. It was a noble undertaking. In 1528 Andrea Doria had restored to Genoa her liberty, and from that date Bonfadio started his annals. He had to write, in fact, the history of Genoa under the constitution which had been the first to secure her against the constant contests for authority amongst the great families — contests which up to that time had filled so large a part of her domestic history. The work was executed in a manner that may be pronounced perfect, whether with respect to the happy style or the accuracy of statement which characterised it. But it happened that amongst the events recorded in the twenty-two years, the story of the conspiracy of Gianluigi Fieschi occupied a very prominent place. Now all the archives of the State had been open to the inspection of Bonfadio. Either by their means, or by others to which, from his position, he was allowed to have recourse, he had become acquainted with a heap of secrets compromising many members of the aristocratic families. The reader who has accompanied me so far will probably recollect that many families belonging to the Portico Nuovo had given their adhesion to Fiesco; that even after the conspiracy had failed the Senate had actually treated with the elder surviving brother of the drowned Gianluigi; and that it was due, solely and entirely, to the personal influence of Andrea Doria, that that august body had consented to pursue ‘to the bitter end’ hostilities against the members of the family. It is very evident that the Fieschi had been supported openly by many, secretly by a considerable number, of the members of the Senate. It may even be inferred that their adherents were not to be counted in the Portico Nuovo alone. There may possibly be some who would agree with Apollo. Now, in writing the annals of that conspiracy, two courses were open to Bonfadio, — the honest and the dishonest course. He might tell the truth or he might disguise it. There was no middle way. The object of the compilation of the annals was to ensure for posterity an authentic record of the events of each year, without favour or affection for any man or any body of men. It was probably to ensure this result that the task had been entrusted to a distinguished foreigner, — though an Italian, — rather than to a born Genoese. Truth and impartiality were even more essential than a good style. Bonfadio possessed this peculiar qualification for the task, in that, whilst a distinguished writer, he had apparently no interest to conceal the truth. Obliged to speak, his inner conscience forced him to speak all he knew. For such a man there could be but one course. Yet in Genoa — the city in which the educated people were money-making rather than intellectual — it was a course fraught with danger. The stern old man whose vigilance and caution had received so terrible a blow from Gianluigi Fiesco, and whose fiat was still supreme in Genoa, had not yet satiated his vengeance. The publication of all the secrets Bonfadio had acquired would, besides, induce the inference that he possessed others which he had not as yet divulged. The secrets of half the nobility of the city would thus be dependent on his forbearance. Yet Bonfadio did not hesitate. His Annals were found to contain such an account of the baffled conspiracy as could be acquired only by one who had acquainted himself with its most secret springs. Then occurred one of those resolutions which most surely mark a low temperature of morality in a society. Bonfadio, it was evident, possessed certain secrets which many members of both Portici knew to be compromising to themselves. It was not as if each of those members had made a confidant of his fellow. Bonfadio, by the knowledge he had displayed in his annals, showed that he knew the secrets of each. Not one was sure that he might not at any moment be denounced. Without confiding in each other, all the secret conspirators knew instinctively that Jacopo Bonfadio was the common enemy of all. Instinctively, too, each man simultaneously felt that Bonfadio must be got rid of. Not simply banished, for then he might tell his tale in other lands, but so dealt with that his tongue might be for ever silenced. Bonfadio, in fact, must die. But how to accomplish his death. His life had been blameless. He was unmarried. They could not strike him through a wife. But he must be got rid of. The lie which could alone effect this must be a good one; it must have something in it of probability; something which was associated with the previous habits of the man. To unscrupulous Spirits of the baser sort the fabrication of such a lie was easy. It was produced. An infamous crime was manufactured, and Jacopo Bonfadio was Condemned to be burnt alive. Non mimis intumuit nuper Benaeus alumni. Bonfadium Letho das scolerate Ligur. Immeritum sseva lege neoare potcs? Pundit; et es scopulis durior ipsa tuis. Trajano Boccalini, again, takes occasion to warn all writers of history, by the example of Bonfadio, against writing anything prejudicial to the honour of powerful members of a community; whilst Garuffi, in ‘Italia Academica,’ expressly asserts that ‘the capital crime of Bonfadio was his having described, with the freedom which is the duty of an historian, the conspiracy of the Fieschi.’ Finally Ottavio Rossi declares that’Bonfadio was really doomed to death for secret reasons of State, and not for the crime imputed to him.’ It is true that the historian, Mazzuchelli, summing up the various opinions which he cites, thinks it not impossible that he may have appeared guilty of having incurred the hatred of certain families, and also of the crime; but whilst he rests the evidence of his guilt of the crime solely upon some Latin verses written at the time by Bonfadio’s friend, Manuzio, who, in his turn, accepted the sentence as proof of guilt, Mazzuchelli proceeds to indicate that he may have made enemies not only by the freedom of his Annals, but by the honest freedom of his tongue, one example of which he cites. The opinion, then, of Mazzuchelli is certainly not borne out by the concurrent testimony I have cited, nor would it appear to be endorsed by later writers. Of these I will cite only one, Giunio Carbone whose work, the ‘Compendium of the History of Liguria,’ appeared in 1837. To write history, a mind resolute and impervious to fear is necessary. To expose nakedly the facts of a case is but a small thing; but to reveal the causes, to point to the consequences, and to assign to each actor his proper part, is the proper office of an historian. When this is done with respect to men of a past era, no danger is incurred; but, when men still living are referred to, it becomes necessary to offend either truth or the wrong-doers. For the first fault posterity will punish us; for the second, the offended wrong-doers will fabricate vengeance. It is never difficult for human malignity to paint its charges with the colour of reason. Jacopo Bonfadio had lived the greater part of his life wandering and unhappy. Nature had endowed him with a mind never satisfied with itself. After many wanderings he settled in Genoa, the life in which pleased him. To him was then allotted the duty of writing the annals of the Republic, and all the grandees of Liguria emulated with each other to do him honour. He wrote his work with great spirit and elegance, though not altogether with prudence, especially in his account of the conspiracy of the Fieschi. As an eyewitness of the event, and possibly aware of the part taken in it by certain grandees, he could neither suppress nor soften certain light allusions and certain pointed indications, which, in our days, may, indeed, have lost their significance, but at that time were as knives and spears piercing the hearts of many powerful nobles. ‘Now, those who were pricked in their own consciences, and who knew that Bonfadio was acquainted with their many secrets, terrified lest he should make still more important and damaging disclosures, tortured their ingenuity how they might rid themselves of him. Examining, then, very minutely his habits and mode of life, and finding therein no fault, not even a pretext, whereby they might convict him of a State crime, they thought they might compass his destruction by accusing him of some grave outrage against religion or morality … A process having been instituted against him, and he having been declared guilty, he was condemned to be decapitated and then burnt. The sentence was executed. But I do not believe, nor is it possible for me to believe, that he suffered so severe a penalty for a crime of that nature; nor can I conceive how the Ligurian Senate would have been so severe and ferocious in an age when Pierluigi Farnese boasted of greater atrocities, the indecent accounts of which were circulated in every country. No! the death of Bonfadio is attributable to far more potent causes — to the terror of that hypocrisy which veils the deadliest vengeance with professions of religion and of virtue, to the necessity of applying discipline to one who speaks about the most important affairs of the age in which he lives. No heart finds happiness, no bosom rest. Most brief those hours in which they.re most intense. Delights in the water clear. Seem, Laura, to murmur but thee! No sweeter boon than thee. From those eyes so soft and clear. Art more than a goddess to me. Their tale of love and of praise. Oh! Love! shall I win thee at last? Quum memini de quo venerit ilia loco. Diis superis: salve dia Coloniola. Protendat; nec te deruat ilia dies. Saepe vocanda mihi cara Coloniola. I should be glad to give a specimen of the clear and vigorous style of the Annals, but I refrain. It is possible I may some day be tempted to translate them into our language. I have met no Italian writings which would so well adapt themselves to the robustness and vigour of the English tongue. For the present, I leave, and leave with regret, the name of Jacopo Bonfadio. He was not the first, and probably has not been the last, victim to the malignity of inferior natures, alarmed by the dread of the discovery of their own evil deeds. But to a noble nature his fate, sad as it was, possesses an element which reassures. It is true his enemies killed him. But, after a lapse of three hundred and thirty years, his name still lives, clothed with honour, veneration, and respect. But for those who killed him! A too kind Providence has preserved them, by the annihilation of their very names, from the execration of posterity! * Even the year is a matter of dispute among various sources.